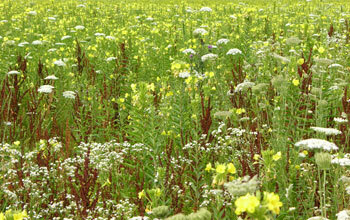 A large natural population of evening primrose (yellow flowers) in Ithaca, New York. View a video interview with Anurag Agrawal of Cornell University. At first blush, many people would probably love to get rid of insects, such as pesky mosquitoes, ants and roaches. But a new study indicates that getting rid of insects could trigger some unwelcome ecological consequences, such as the rapid loss of desired traits in plants, including their good taste and high yields. Specifically, the study–described in the Oct. 5, 2012 issue of Science and funded by the National Science Foundation showed that evening primroses grown in insecticide-treated plots quickly lost, through evolution, defensive traits that helped protect them from plant-eating moths. The protective traits lost included the production of insect-deterring chemicals and later blooms that gave evening primroses temporal distance from plant-eating larvae that peak early in the growing season. These results indicate that once the plants no longer needed their anti-insect defenses, they lost those defenses. What’s more, they did so quickly–in only three or four generations. Agrawal believes that his team’s study results are applicable to many other insect-plant interactions beyond evening primroses and moths. Here’s why: The ubiquitous consumption of plants by insects represents one of the dominant species interactions on Earth. With insect-plant relationships so important, it is widely believed that many plant traits originally evolved solely as defenses against insects. Some of these anti-insect plant defenses, such as the bitter taste of some fruits, are desirable. “This experimental demonstration of how rapid evolution can shape ecological interactions supports the idea that we need to understand feedbacks between evolutionary and ecological processes in order to be able to predict how communities and ecosystems will respond to change,” said Alan Tessier, a program director in NSF’s Directorate for Biological Sciences. In addition, oils produced by evening primroses have been used medicinally for hundreds of years and are beginning to be used as herbal remedies. Agrawal’s insights about pests that attack these plants and about chemical compounds produced by these plants may ultimately be useful to the herbal and pharmaceutical industries. More information about this study is available from a Cornell University press release. The research results are described in the Oct. 5, 2012, issue of the journal Science.